Did you know there are some people out there that don't like to eat BBQ ribs? I know! Weird, right??? I ran into a few of these weirdo's at a cookout one time and I launched into full-on interrogation mode because I couldn't comprehend the idea of not wanting to gnaw on a pork bone. Turns out both of these people (yeah, real scientific evidence, I know) said that ribs were "too hard" to eat and in fact, they actually like baby back ribs because hey, they sell them at Chili's! Ignoring the fact that they implied Chili's ribs set some kind of rib bar in their minds, it turns out that they didn't really know what to do with the tip on a spare rib. It's true, a spare rib tip is a strange cut of meat. There is some delicious meat to be had on the tip, but it's a little difficult to get to with all of the cartilage. So how do we make it "easier" on these poor rib novices to eat a "real" rib? St. Louis ribs style, that's how! 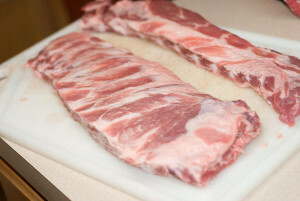 St. Louis style ribs are just pork spare ribs with the ends trimmed off. The process is really easy and it leaves you with a perfect looking rib that is pretty much all meat, making it really easy to eat. Sure, you can get the butcher to cut them, but where's the fun in that? No, you don't need a reciprocating saw, we're talking about cartilage here so a sharp knife and a cutting board will do. 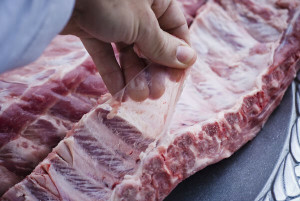 So grab your knife and board and unwrap one of those beautiful racks of pork spare ribs and let's get to it. 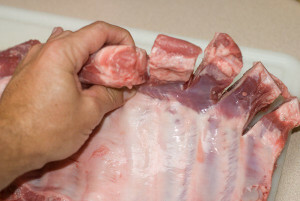 1Plop the ribs down on your cutting board with the bones facing up. 4Locate the tips, the thickest part for those of you having trouble, and bend them back towards you. See the joint where they bend? That's your guide for cutting. Check out this photo if you are having trouble. 9Ok, now we come to what I think is one of the most difficult things for a first time rib cooker to learn, removing that dang membrane on the back. In general, I like to play the lotto if the thing starts easily and comes off in one piece. It's rare, but you are having a great day when it does. For the rest of the days, just keep taking it in strips. Start at a corner and use a paper towel to get a grip, then start ripping. 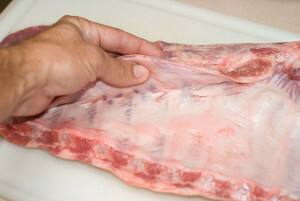 12Let the ribs sit in the fridge for a few hours or overnight to let the rub marinate the ribs, if you have time. 13Smoke your ribs for about 5 hours at around 225 - 250 degrees. I say "about" and "around" because every pig and every cooker is different. Let the ribs tell you when they are done. 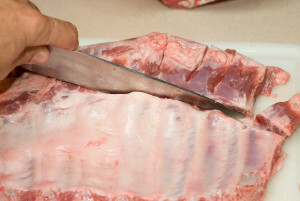 You can use two methods to see if they are done, without cutting into the meat. First, pick them up from one end with tongs. If the meat starts to "crack", then are pretty much done. Second, insert a toothpick between the bones. When they are done, there should be very little resistance. Try it first when they are raw so you can tell the difference. 14During the smoking process, I like to spray them down with apple juice every hour or so. 15Hit them with some good barbeque sauce about an hour before they are done. 16Present them to your rib novices and teach them to wear those barbeque sauce stains with pride! 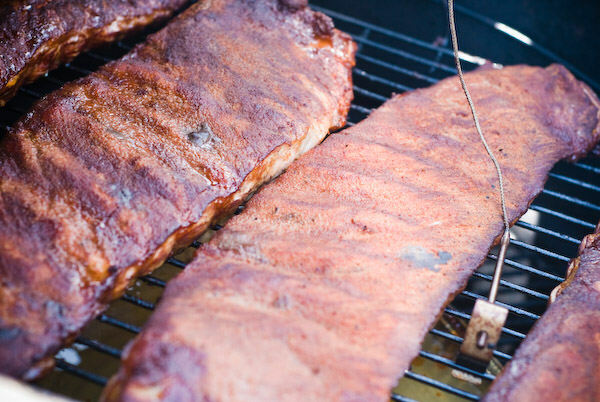 If you want to know more about how to cook St. Louis Style, baby back or spare ribs, check out our BBQ Ribs for Beginners article. This recipe is amazing . I been cooking this since maybe 6 years ago. Allways great taste. Learn it, practice, perfect it.